The lolo Archive is a file-based repository appropriate for data which you rarely access but for which you want to ensure long-term safekeeping and fast, convenient retrieval. 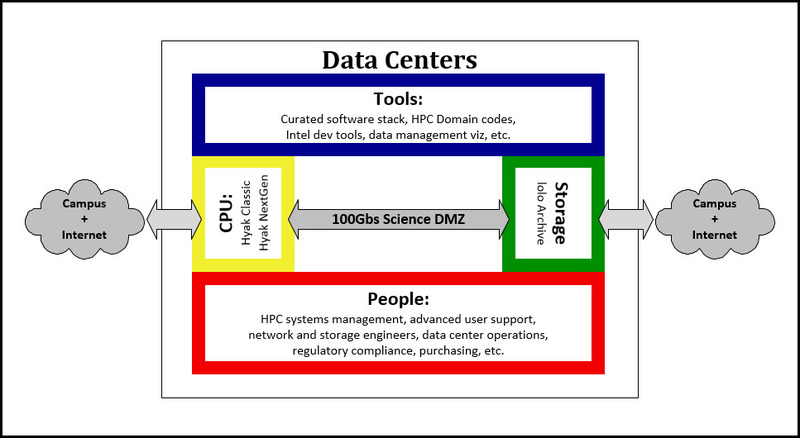 The following diagram illustrates the data center environment in which lolo Archive resides. The lolo Archive is part of the integrated, scalable scientific computing infrastructure operated by UW-IT, including Hyak, the lolo Collaboration File System, and a high performance research network, supporting fast data transfers among these systems and between them, campus and the Internet. Storage may be purchased in 1TB increments up to 1PB or more. Evaluation accounts are available upon request. Periodic Regular Maintenance is scheduled to match the Hyak system maintenance schedule. Hyak will be offline from 9:00 a.m. to 5:00 p.m. for scheduled maintenance the second Tuesday of every month. Every third month, the maintenance window will last from 9:00 a.m. to 9:00 a.m. the following morning. Storage may be purchased in 1TB increments. Billing is based on the storage allocated, not the capacity consumed. Billing is monthly. Price subject to change annually on July 1st. Mid-year rate reductions are possible when customers purchase 200TB or more. Rates are the same for all customers. lolo Support responds to problem reports in one to four hours; response can be escalated if there is a critical problem. Our goal is always to minimize user downtime by responding as quickly as possible. Planned maintenance windows match the Hyak system (8 hours during business hours on the 2nd Tuesday of every month). Please see the Lolo User Documentation for more information. lolo is a word in Chinook Jargon meaning "the whole thing" and "to carry," depending on the application of accents. Written in lower case, lolo also represents a binary string (decimal 10). Chinook Jargon is the trade language of the Pacific Northwest, incorporating terms from the Chinook and Chehalis and other local languages, as well as French and English. We've chosen words from Chinook Jargon for the names of systems in the UW research cyberinfrastructure to emphasize their role in supporting the broad range of UW research users and our ties to our place between the mountains and Salish Sea.